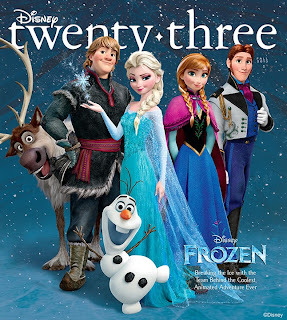 BURBANK, Calif. – July 19, 2013 – Disney twenty-three—the flagship magazine of D23: The Official Disney Fan Club—ushers in winter early, celebrating Disney’s new animated film Frozen. The cover story features exclusive interviews with the film’s cool voice actors Kristen Bell and Idina Menzel, as well as a visit with the filmmakers as they bring Frozen’s wintery wonderland to life in Disney’s 53rd animated feature, coming to theaters this November. Walt Disney lives on in “Every Picture Tells a Story,” an article showcasing newly discovered photos Walt shot with his personal camera. The photos provide a unique opportunity for fans to see Disney’s world through Walt’s eyes. D23 Members will also get a special treat as former International Ambassador for Walt Disney Imagineering and Disney Legend Marty Sklar welcomes readers inside his home to discuss the fascinating new book about his career shaping timeless Disney icons: Dream It! Do It! : My Half-Century Creating Disney’s Magic Kingdoms. Disney twenty-three’s Fall issue also offers a look at Disney parks around the world. Readers journey across the Pacific Ocean to Tokyo Disneyland to celebrate its joyful 30th anniversary in “Happiness in the Park,” and head to Hong Kong Disneyland’s Mystic Manor to explore one of Walt Disney Imagineering’s most multifaceted and exhilarating attractions yet. Also in the Fall issue, members will receive one of two exclusive magnets designed by artist Kevin Kidney. These high-spirited, retro-style magnets pay homage to the Haunted Mansion’s Hatbox Ghost and Tinker Bell, during this trick-or-treat time of year. Fans can join D23 at Gold, Silver and Free Membership levels at D23.com and at www.DisneyStore.com/D23. To keep up with all the latest D23 news and events, follow us @DisneyD23 on Twitter, Facebook, Pinterest, and YouTube.